It’s been 19 years now. On June 14, 1997, U2 played their very first concert in Edmonton AB, in Western Canada. On June 15th they played their second show in Edmonton. I’ve got a bit of a soft spot for those shows, because they were the first concerts I managed to attend. I got lucky, I was in Edmonton on a work term, and there was no way I could afford to travel to see a show. So when they announced the PopMart tour was coming I was beyond excited. One of my co-workers and I took the morning off work to get tickets. And we stood in line at a Ticket outlet south of Edmonton in -20°C weather for hours. We got to the window just as the first show sold out, but luckily were first in line for the second show. Up until that point I didn’t even have a credit card, but the announcement came with enough time to go out and arrange to get one, and my first purchase on my credit card was U2 tickets. I would later end up using Propaganda tickets instead, supplied by a good friend of mine, but wanted to be sure I had all my bases covered. I wasn’t disappointed. My tickets the first night had me sitting with Morleigh and Anne up in the fourth row. The second night I ended up at the B-Stage right against the rail. I can remember being amazed to be able to hear Larry Mullen hitting his drums a split second before I could hear it over the PA. And those shows were pretty special. You could tell Bono appreciated the welcome. The crowds were nuts. The concert on June 15, was one of only twelve times that the band has played “Slow Dancing” live in concert. The History Mix column isn’t a place to just look back at our own memories though, it is a place to look at U2’s history. And I’ve always appreciated the fact that the Edmonton show has been released in pieces over the years. 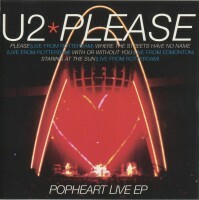 On September 22, 1997, U2 released a version of the single for “Please” titled the “Popheart Live EP“. The single was first released in the UK, and slowly rolled out to the rest of the world. It was released in Canada on October 10, and in Australia on October 13. The EP contained four live songs. Three songs were taken from a concert on July 18, 1997 in Rotterdam. But the fourth song on the EP was “With or Without You” from the June 14, 1997 concert in Edmonton. How special it is to have a souvenir of your first U2 show released? The “PopHeart“ EP was a success in Canada. It made it to #4 on the sales chart, which isn’t the best position a U2 single has ever reached, but more surprising was that it stayed there for over a year on the sales chart. On the airplay front it did less successfully only reaching #47 in the Canadian charts. But that’s to be expected as most stations don’t play live tracks, but you could hear this song recorded in Edmonton played routinely for months after the release of the album, so that chart success may have been just from that one city. In the USA, the “PopHeart“ EP was not issued for sale. Instead, months later, on November 25, 1997, the “Please“ single was finally released in the USA. The USA single did not contain any of the B-Sides that other regions had received on a second disc. 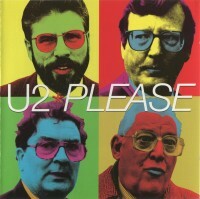 Instead their version of “Please” contained the single version of the title track, and the four live songs. When iTunes released “The Complete U2” it did include these live tracks for sale as well, and they were included as tracks in the “Please“ single instead of appearing as a separate “PopHeart” EP. These are however, no longer available on the iTunes store. When the Popmart VHS was released in 1998 it did not contain any bonus materials. However when the DVD was released in 2007 a number of tracks was added. And for the first time three additional tracks from the concert in Edmonton on June 14, 1997 were released in video format. The bonus disc included full performances of “Hold Me, Thrill Me, Kiss Me, Kill Me,” “Mysterious Ways,” and “One” from that first concert in Edmonton. Both concerts in Edmonton had been filmed using U2’s own video team, as well as extras from Much Music. These three songs are the only footage that has been released to date, but various full videos from the second show on June 15, 1997 have been available as bootlegs for years in professional quality, and a soundboard audio boot of the second show exists under the title “Amazing Grace”. For a time in 1997, we turned our focus away from the discography we were working on and instead focused our efforts on a PopMart Edmonton site. The site featured reviews, photos, and even some audio snippets from both concerts. We have uploaded the press clippings section from that site today if anyone would like to take a look back. If you watch at 0:23, and again at 0:29, you’ll see me turn toward the camera, and later get very excited. I again look at the screen around 0:50 before the camera pulls back.